Ras Shiloh’s brand new Cd titled “Coming Home” produced by Bobby “Digital” Dixon, on the VP records label, is a honorable volume of new music. 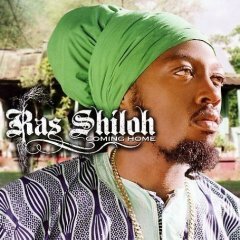 Ras Shiloh’s music never has a rushed or hurried approach and that is clearly evident in the content of “Coming Home”. There are some songs that will definitely be hits with longtime Shiloh fans, as well as converting some new ones too! Ras Shiloh’s message resonates with kindness, upfullness, and awareness. It is been a pure joy to experience this singer’s rise to success with his conscious music and heartical vibrations. This album has three tracks with guest singers, Morgan Heritage, Bascom X and Natural Black. There are some tracks that really deserve acknowledgment for their tremendously potent lyrical content. The opening track “We Need More Love” starts the course for some divinely inspired music. A simple message that can’t be stressed enough. Let’s show more love mankind. “Let The People Voice Be Heard” heralds a call to dem heads of Government who just can’t seem to remember their job is to listen to voice of ALL people, no matter what race, class or religious belief. With the great Morgan Heritage vocals adding to the spiritual heights, this song is a new classic. “Shout in his name with praise, shout in his name always” proclaims Ras Shiloh with such sincerity in the fourth song titled “What You Have Done”. You can’t help but feel his love for Jah. I would hope that others outside of the reggae community would recognize this songs potential to crossover to other musical genres like Gospel and R&B, while still maintaining a Roots Reggae foundation. The next track featuring Bascom X, “The New Rising Day” blends the two sounds of Ras Shiloh’s soulful singing style with Bascom X’s up-tempo chanting to create a real nice tune. A real Irie duo, for your listening pleasure. The eighth track, “ Volume of the Book” Ras Shiloh sings about the righteous works contained within our father’s instructions. The next tune with Natural Black, “It will be over”, Shiloh asks the listener, “Which road will you choose?” Natural Black lays down his signature, original vocals on the chorus. The title track “Coming Home” features Dean Fraser’s wonderful saxophone adding to the gifted singing of Ras Shiloh to create a memorable tune. Dean Fraser is featured throughout many other tracks on this album. Other musicians who contributed to making the album“Coming Home” are Mikey Spice on Keyboard and bass, Donald “Danny Bassie” Dennis also on bass, Dalton Browne on guitar, Kirk Bennett, and Squidley Cole on Drums, Paul “Lymie” Murray, and Nicky Burt on background vocals. There are many other tunes, 16 in all, that make “Coming Home” well worth the wait. I can appreciate an artist’s music much more when some time and planning goes into creating a new studio album. Ras Shiloh, along with Bobby digital’s production skill have created a solid new chapter in Ras Shiloh’s musical development.